This excerpt is Part 2 of a shortened version of the story Greg Amundson tells in the introduction to his new book FIREBREATHER FITNESS. Did you miss Part 1? See Amundson’s first introduction to Greg Glassman in Part 1 here. We went back up the stairs and strapped ourselves into the rowing machines. Just before the workout started, Coach looked at me and said, “Kid, be careful walking down the stairs.” Are you kidding me? Why on earth would I need to be careful on a simple staircase? In a booming voice, Coach announced the start of the workout: “3, 2, 1, go!” Mike and I ripped into the rowing machines. This was my first time rowing, so I didn’t know much about pacing, but I was a competitive person. The adrenaline of the “race” structure of the workout took hold. I wanted to beat this guy. I wanted to beat this guy bad. My cop ego made this even more heated. I not only wanted to beat him in this 1,000- meter row, but I wanted to make it look like it didn’t fatigue me in the least, that crushing him in this workout was a breeze. 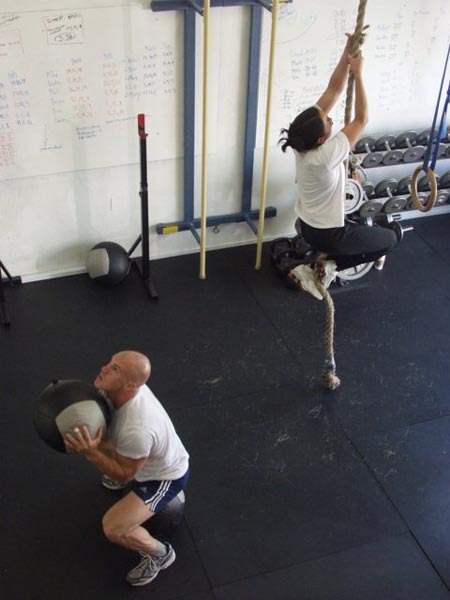 One of Greg Amundson’s first CrossFit WODs. That wasn’t how it worked out. Mike bounded off the rower before I did, finishing the 1,000 meters and skipping down the stairs right to the kettlebell. I finally finished, having given everything I could muster. I didn’t bound off the rowing machine like Mike. It was more of a crawl. I felt myself revisiting that drained, powerless feeling I had in my fight with the parolee. Everything was hazy. Once again it felt like I was desperately breathing through a straw. As I made my way down the stairs, my legs felt rubbery, as if I had given a few pints of blood. “Handrail! Handrail!” Coach cried out. I straddled the kettlebell, wrecked and heaving for air. I had 21 swings to do. My scoffing at the 35-pound bell had come back to haunt me. My chest was still heaving and burning from the row. I could barely manage two or three swings at a time before I had to set the kettlebell on the ground. After the 21st rep, I wobbled my way over to the pull-up bar. I wondered: Do I look as green as I feel? I was on the woozy edge of vomiting. I survived the pull-ups the same way I did the swings. Three, two, or one at a time. Mike had whizzed through them, using some sort of crazy gymnastics pull-up I later learned was called a kipping pull-up. With regrettable form, I eked out the last of the 12 pull-ups. It was a freezing, foggy day in the coastal town of Santa Cruz, but I was burning up, ready to puke, pass out, or both. I crumbled into a heap at the bottom of the stairs, in the corner of the gym. Coach Glassman came over. The aftermath from one of Greg Amundson’s first CrossFit WODs. I had been thoroughly humbled. A master of his work, Glassman never wasted energy trying to make the argument for his training philosophy or about why it was better than other programs. He just showed me by having me experience it. For me, a cop determined to be better prepared for his job, I had found the physical training I was looking for. In my pursuit of it, I took up the mentality of a white-belt in a first martial arts class. I accepted that I was a total beginner. I embraced Coach Glassman’s model of high-intensity training using functional movements. A rapid series of results suggested I had made the right choice. In a short period of time, I made steep improvements at that little gym on Research Park Drive. Its value was apparent; I knew that this style of training would one day save my life.